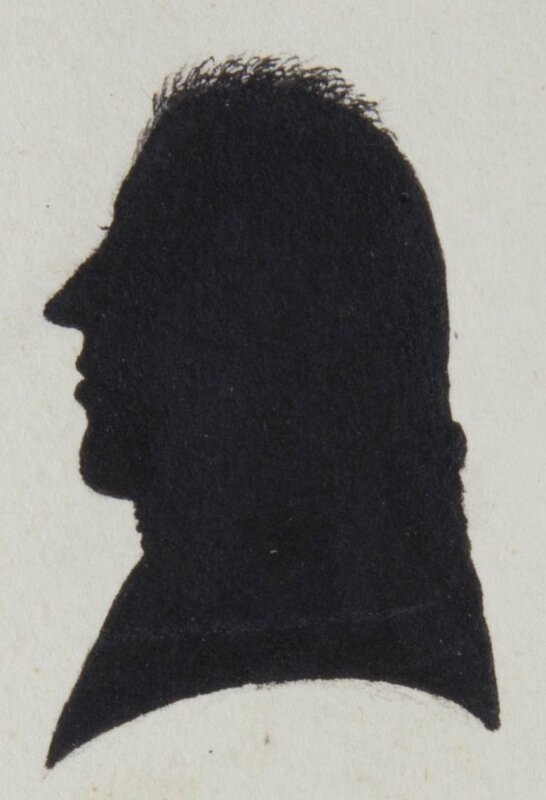 Shade, profile, shadow-portrait, likeness, all popular names used in the eighteenth and nineteenth centuries to describe what became known as a silhouette. The silhouette owes its namesake to Etienne de Silhouette, a French finance minister ridiculed for his severe taxes and whose name became attached to all things inexpensive and austere. 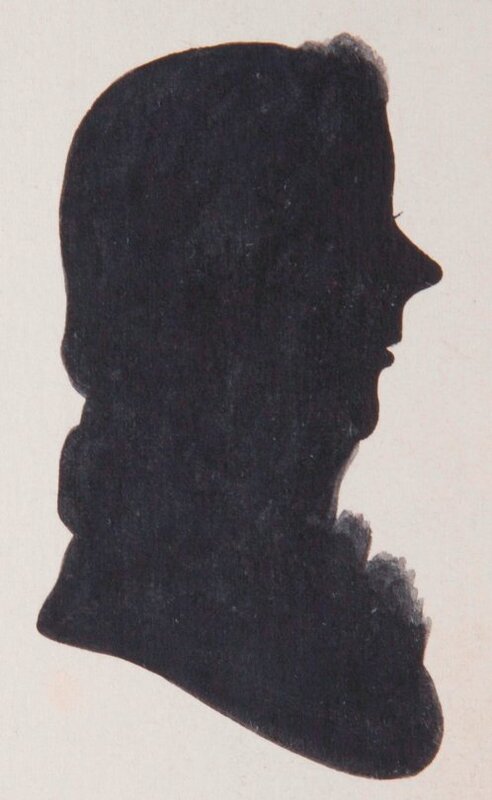 It was the French-born Augustin Edouart’s publication of his ‘Treatise on Silhouette Likenesses’ in the 1830s that brought the French silhouette to England. Silhouettes could be cut out from blackened paper and pasted over a lithographed background, they could be painted on glass to look almost transparent before being embellished with gold, and painted on many other surfaces from paper to plaster and ivory, either in solid monochrome or clothed in vibrant colours. Silhouettes could be produced freehand from real life, or shadows could be precisely traced using machines before being reduced in size with a pantograph, and silhouettes could even be made on a scale so small as to adorn a ring. Silhouettes are a known as a simple art form but they actually varied significantly in design and could be extremely complex, as a look into the following collections shall hopefully reveal. Nestled amongst the pages of the Rix family manuscript are a small collection of silhouettes that depict the children of Simon Rix (1742-1813), a yeoman farmer and his wife Prudence (1747-1821). 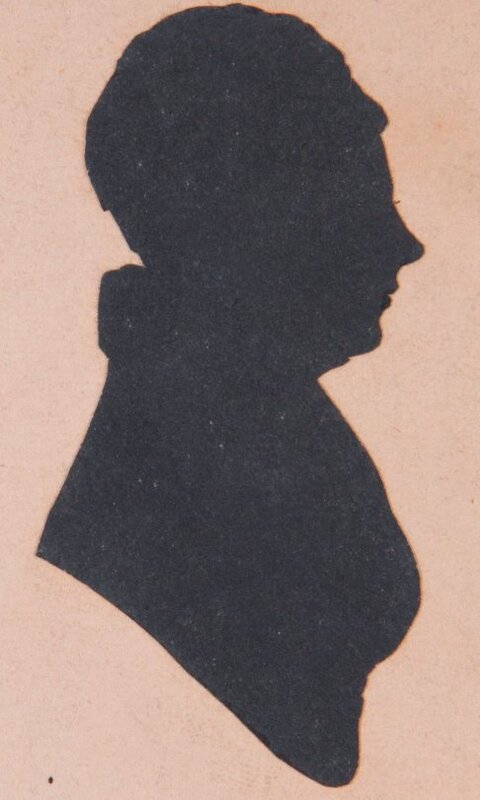 The siblings’ silhouettes are captured by two different hands, whilst John (1768-1807) and William (1778-1818) have their likenesses reproduced in ink (probably by relative Thomas Parker) the profiles of their two sisters, Martha (1771-1829) and Mary (1785-1855) and their brother, Samuel (1774-1849), have been taken by cutting. When each of the cut-out silhouettes are turned over we see that small windows have been cut into the pages to reveal the trade label of ‘Master Hubard’. Hubard and the Hubard Gallery (who employed him) used a variety of trade labels during their fifteen months in Britain and the presence of trade label No.2 on these particular portraits place them decisively in 1822-1823. 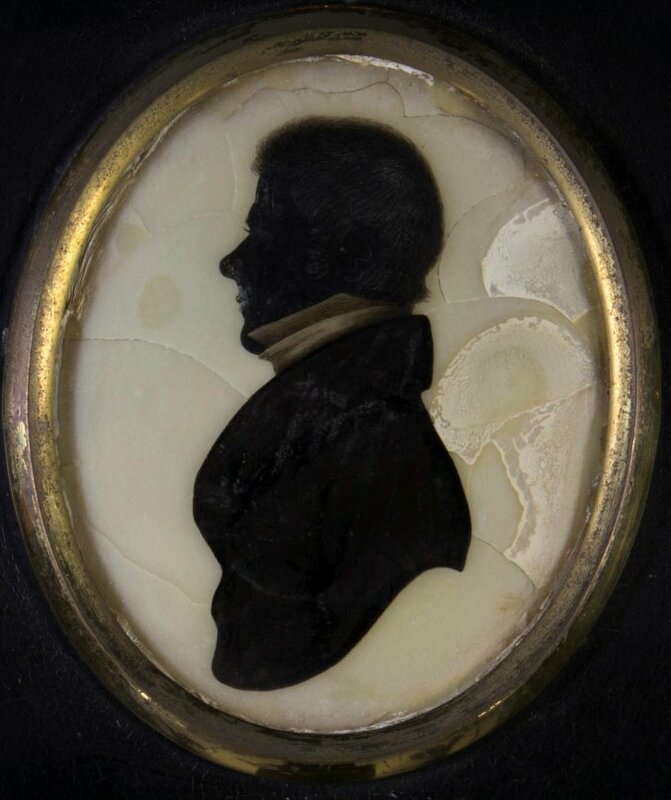 Master William James Hubard was a young, celebrity silhouette cutter in Britain from 1822 to 1825 during which time, from the age of thirteen, he toured the country cutting silhouettes from blackened paper for a shilling a piece or 1s. 6d for two. The cost of Hubard’s silhouettes and many of his contemporaries was about the price of a pocket book, they were not cheap throwaway things but had a fairly significant value as reiterated by the collections’ careful preservation in the Rix’s record book. The Rix silhouettes indicate a fashion for having one’s silhouette cut by a professional silhouettist rather than just in the home. There was broad appeal for Hubard’s work, as a Norwich editorial reveals, ‘persons of all classes seem to be eager to put [his abilities] to the test’ and as a middling class family of farmers the Rix siblings easily fell into the consumer market for silhouettes. Further information provided by contemporary handbills make it probable that the Rix siblings’ silhouettes were taken in at Mr Critchfield’s Market Place in Norwich, close to their home in Uggeshall, where Hubard was working in January 1823 until 12th February of that year. In 1823 the siblings would have been between the ages of 38 and 48 and one can imagine them going to sit for Master Hubard during a trip to the market. Silhouettes could be fashionable items and the allure and showmanship of the young Master Hubard certainly enticed the middle-aged Rix siblings to fork out 1s for their paper silhouettes. The Congregational Library owns a small collection of framed silhouettes and whilst the wax backing has cracked over time the delicate silhouettes which were painted on the underside of the convex glass stand out in near perfect condition. These silhouettes depict the members of a Middlesex manufacturing family, Samuel Mills (1769-1847), his wife Mary Mills (1765-1837), and his two sons Thomas Mills (1794-1862) and John Remington Mills (1798-1879), the latter of which would die the richest commoner in England. 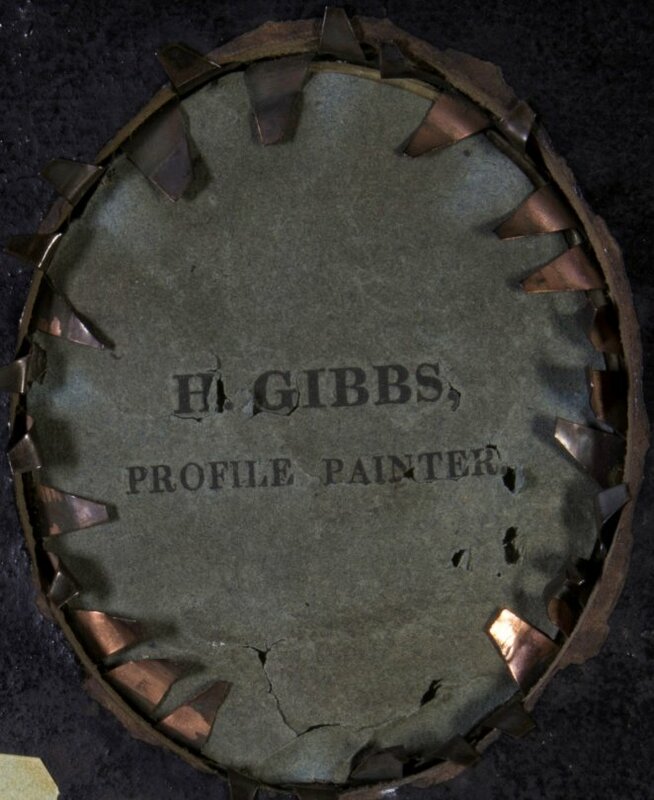 This particular collection were painted by the profile painter Hinton Gibbs and the silhouette of Samuel Mills bears a perfectly preserved version of Gibb’s trade label No. 5, which is dated to between 1815 to 1817. 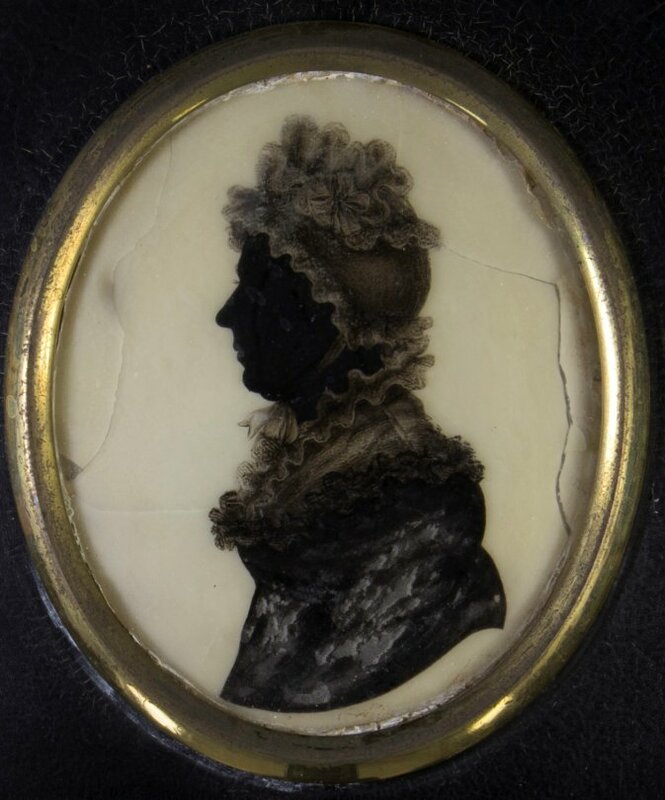 The Mills silhouettes are housed in little papier-mâché acorn frames which were popular throughout the nineteenth century for displaying silhouettes and it is likely that the silhouettes and the frames were both sold by Gibbs, as this seems common practice in contemporary adverts. 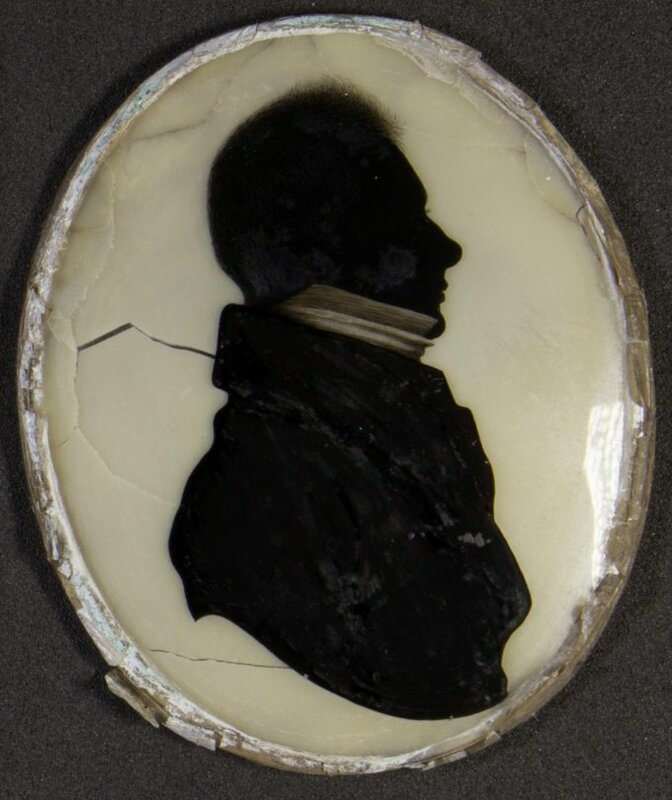 Gibbs famously used fingerprinting, a technique by which involved dipping ones finger (in some cases fingerprints are visible) into a paint mixture and pressing it onto the glass to produce a delicate almost translucent effect. Detail would then be added with the addition of paint and through etching into the base with a needle to produce fine details. Gibbs interestingly only used this technique in his profiles of women, of which his silhouette of Mary Mills is an excellent example. 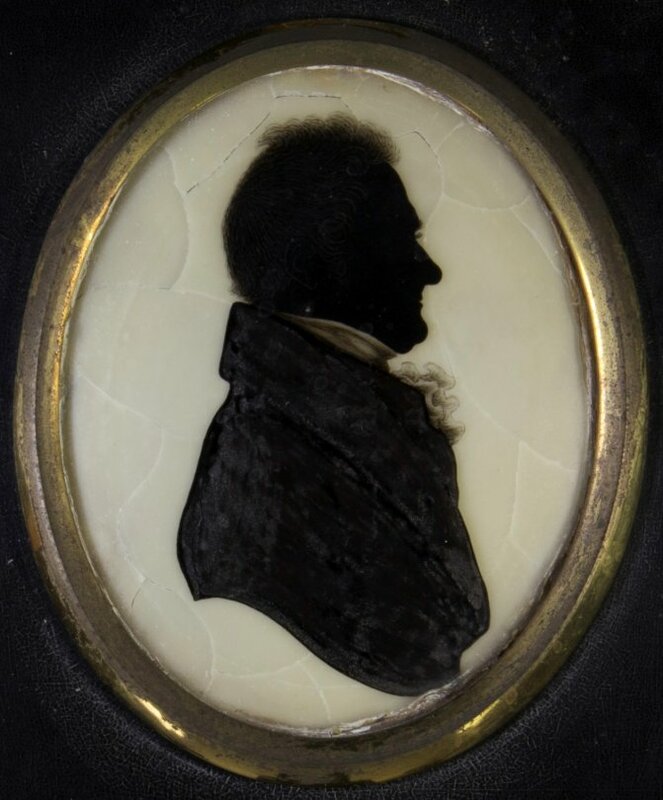 Gibbs choose to paint men in almost sold black with a little detail on collars and hair as is evidenced in the male silhouettes in this collection. Whilst little is known of Gibbs his work is of a very high calibre and comparable to the finest silhouette painters on glass. The Mill’s silhouettes would have been a much more expensive than those cut from paper and could have cost Thomas Mills anywhere from five shillings to one Guinea each. 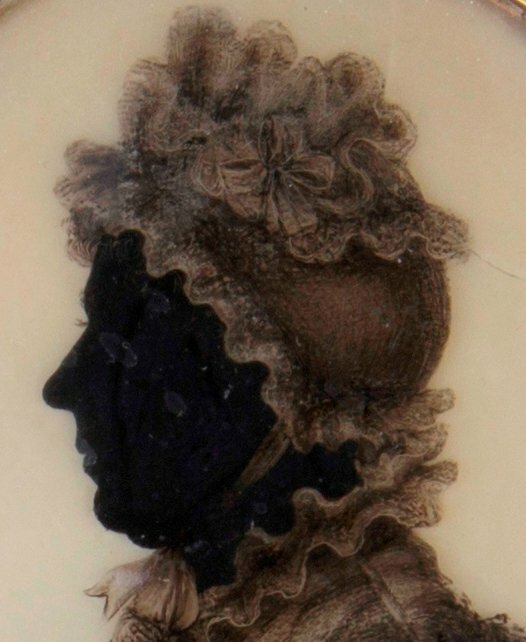 Evidently the Mills family had invested in what was a fairly high cost product, this was not only so they could own a replica of their profile, which could be attained much more cheaply in paper, but because silhouettes were a valued art form. 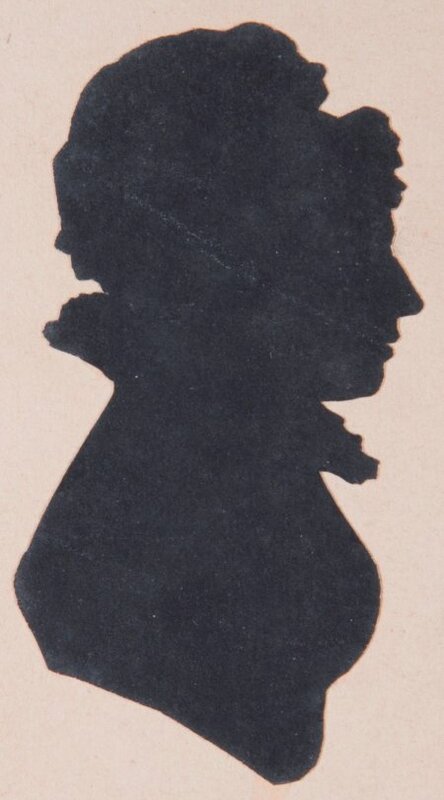 The eighteenth and nineteenth centuries’ obsession with silhouettes was partly inspired by popular ‘scientific’ theories like physiognomy and phrenology but they were also widespread as fast and fairly inexpensive items and the Rix and Mills family certainly bought into this fashionable consumer trend just before the influence of silhouettes was beginning to wane with the arrival of photography in the 1830s.